Finally restocked the evening primrose oil (EPO) capsules after skipping for a few days. Guardian offers 2 bottles of Blackmores Evening Primrose Oil 1000 (containing 180 capsules each) and a smaller bottle (60 capsules) for the price of RM99. So cheap, right? I never knew the benefits of EPO and didn't bother to find out about it until Joanna told me about it when I was telling her about the dreadful monthly cramps I usually had. After consuming for a few months now, I don't have problem with unbearable cramps. Of course, there are cramps but they are the kind that don't force me to stay in bed for half a day. Let you see the beautiful flower from where the oil came from. 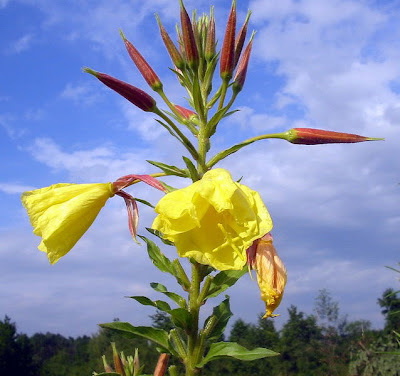 Benefits of evening primrose oil and its origins can be found here. Food & Beverage Operations paper is on the first day of December, Rooms Division the following day and 4 days later, Management Accounting. After that, I am free! I can't wait for the merry holidays to come.